Flote a través de cuevas en vuelo y luego vuele de árbol en árbol en una aventura privada de 6 horas desde la ciudad de Belice que combina la tubería y un emocionante reto tirolina. Camina por el bosque, luego flota en el Caves Branch River en cavernas bordeadas de piedras de flujo y estalactitas erizadas. Cambia el tubo por un arnés y luego lánzate al aire desde una serie de ocho plataformas conectadas por cables que se extienden hasta 1.200 pies (366 metros). Rappel vuelve a la tierra desde la plataforma final y recupera el aliento antes de regresar a la ciudad de Belice. An interesting and relaxing tour through the forest and caves. Fun low-key tour. 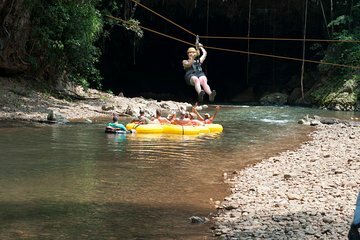 Great fun zip lining through the jungle then a relaxing float through the caves. The guides were super and the adventure was something we'll enjoy forever. We would love to do it again. Keith was a PHENOMENAL GUIDE! This was a completely exclusive tour- just me, my hubby, and our amazing tour guide Keith. He gave us as much special treatment as he could, trying to make our tour very personal. The entire ride to the mountain, he gave us a history and tons of details and fun facts on Belize. One of the most knowledgeable tour guides I have ever encountered. He drove us in an AC van, and it was very clean and comfortable. Once we got to the site, he knew where to go and who to speak to, and we made the trek up the mountain so that we could enter the caves. GORGEOUS and once in a life time experience! After, we went zip lining on the same mountain- I highly recommend doing both! After that, Keith had our lunch ready- it was the food being sold at the local restaurant on site at the mountain. Delicious jerk chicken! I loved this tour and if I ever visit Belize again, I will be in touch with Keith at Private Belize Tours! First time ever in a river cave. Guide was great. Tour was fantastic. Like nothing I've done before. This trip was so great we had to do it twice! We originally booked for our first day in Belize and our guide Keno not sure I spelled that right was super! He picked us up at the hotel and told us about the people and places and everything we past. When we reached the zipline he left us in the great care of Osmun and Milton. It was cool and sprinkling and we were the first ones out for the day and got to take our time and enjoy the scenery and visit as we enjoyed the AWESOME ziplines. After that Keno took us on a 30 minute hike thru the rain forest for our cave tubing. He told us all about the plants and trees and their medicinally uses. He was so interesting! We enjoyed the cave and floating down the river, it was beautiful! After that we had an great lunch of chicken, rice and beans and cole slaw. SO GOOD! Keno then dropped us off at the water taxi to head to Ambergris Caye for the week. We spent our last night back mainland and called Dorian to see if Keno was available to take us ziplining one more time before we headed to the airport. He had another tour for that Sunday but Dorian had Ken take us and once again it was a fantastic time and we learned so much about the land and the culture. Ken even stopped at a local place and bought us a couple of traditional desserts of the area on our way to the airport. Such amazing and friendly people! Loved this trip and will use them again next year! Thank you for taking such great care of us! Great trip great guides. Everything went smoothly.